Today is one of those days when the readings and canticles pair up together beautifully to form an extended image and commentary. We begin with God’s lament in Isaiah — the people do not seek him, though he says “Here I am.” They are rebellious, and they have forgotten their own identity as God’s chosen. The first canticle appointed for this morning is Canticle 8 – The Song of Moses. In it, we remember our identity as the people saved by God and recount the story of the Exodus. “I will sing to the Lord, for he is lofty and uplifted; the horse and its rider has he hurled into the sea” (BCP 85). We then read the Son of Man’s words to the church in Sardis from the Revelation to John: “Remember then what you received and heard; obey it, and repent. If you do not wake up, I will come like a thief, and you will not know at what hour I will come to you” (Rev. 3:3). And then the second canticle appointed for today: Canticle 20. “Glory to God in the highest,” we say, “and peace to his people on earth.” Awakened, we raise our voices in praise. As God’s people, we are saved, but forget that we are a chosen people. We are redeemed, but do not live like anything has changed. “Remember!” says God. “Wake up!” says the Son of Man. “Heavenly Father, in you we live and move and have our being: We humbly pray you so to guide and govern us by your Holy Spirit, that in all the cares and occupations of our life we may not forget you, but may remember that we are ever walking in your sight; through Jesus Christ our Lord” (BCP 100). P.S. 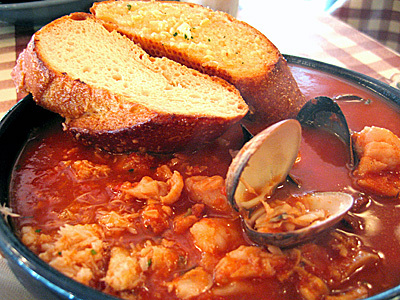 Having just returned from San Francisco, however, where the cioppino with Dungeness crab is simply marvelous, I will say that I have no intention of repenting from my love of the “broth of abominable things in my vessel.” Just sayin’. This entry was posted in Daily Office and tagged Morning Prayer on January 10, 2013 by Rodger Patience.